Offering more affordable mobile locksmith services to Winston Salem. Discount Lock & Key LLC is a locally owned company located in Winston-Salem NC. This allows us to serve a majority of our Forsyth County customers with surprisingly quick response times. 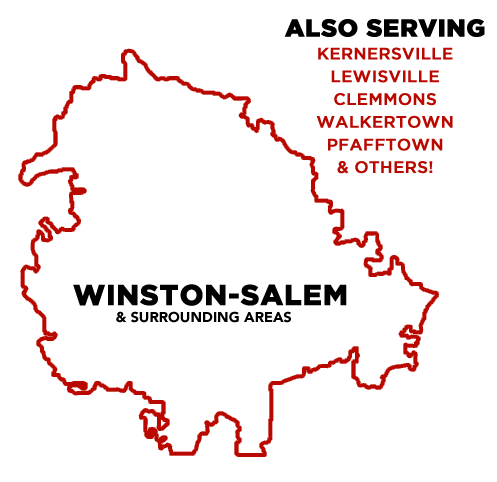 Our service area includes Winston Salem, Kernersville, Walkertown, Clemmons, Lewisville, and Pfafftown. We are a fully mobile Winston Salem locksmith, which means we bring our shop to you! Since we are a mobile locksmith in Winston Salem, we can provide service quickly and conveniently. There’s no need to pay extra fees to tow your vehicle, or wait around at the dealership for a car key replacement. Whether you live in Winston Salem or a surrounding area, as a mobile locksmith, we will come to you! We accept appointments for any time of day or can simply be at your location on demand. We pride ourselves on outstanding customer service, by offering quality mobile locksmith services, and providing fast, affordable key services. When you locked the keys in the car or need car key replacement, we are qualified and experienced and would love the chance to help ease your mind, especially if you’re needing an emergency locksmith. If you’ve lost keys and need immediate lock rekey service, we’re here to help. If you’re locked out of your house or car, make us your first call. And if you’re in need of door lock changes, we specialize in that. Give us a call today to find out just how affordable these locksmith services actually are. While we don’t want you to lock your keys in the car, or need car key replacement, we do want to be the ones who help you resolve an unfortunate situation. Not sure how much a locksmith costs in Winston Salem? You can find our locksmith pricing guide here! We offer upfront locksmith service prices, because we don’t like surprises anymore than you do. The price we say is the price you pay, our prices stay the same. We won’t take advantage of your situation, even in emergency locksmith situations. You’re surely already stressed enough! We try to alleviate your stress by quickly helping you and keeping our pricing predictable and consistent. Follow us on Facebook for coupons on our Winston Salem and Kernersville locksmith services. Like our page and print your free 10% off any service coupon today! Follow our page and read reviews by previous customers or leave your own if we’ve helped you before! Are you interested in a free coupon on keys locked in car, lock change, broken key extraction and more? Simply like our facebook page then print or display our 10% off ad during time of payment.